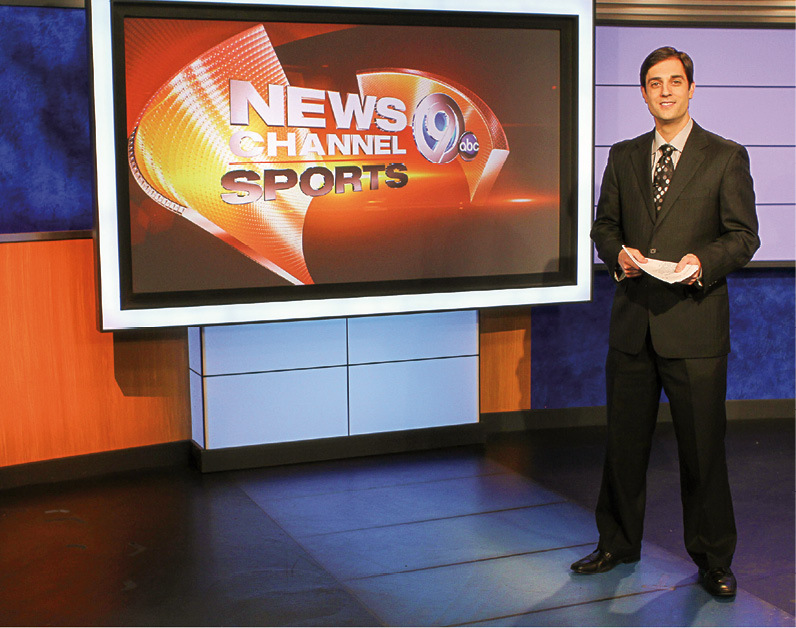 When the red light on the studio camera flashes, it’s “go time” for WSYR-TV’s Sports Director Steve Infanti. It’s his signal that he’s live, on-air. It’s time to deliver the day’s sports stories to the people of Central New York. Infanti says he gets that same “go time” feeling when he’s back at his high school alma mater, Bishop Ludden Junior/Senior High School, covering a basketball game for his station. Back in the 1990s, Infanti was a point guard for the Ludden Gaelic Knights. The 37-year-old father of two has reported and anchored for Syracuse’s News Channel 9 for the past 15 years. A graduate of Ludden and the Roy H. Park School of Communications at Ithaca College, he says he knew, even as a young boy, that he wanted to write and play sports. When he got to high school, he decided exactly what he wanted to do: work in communications, no matter what type. And he wanted to play basketball. He joined the varsity team in his freshman year. By junior year, he and his teammates made it to the New York State High School Basketball Championship playoffs in Glens Falls, NY. They fell just short of becoming state champs in 1993, losing to Whitney Point. It was a disappointment, Infanti said, but his coach encouraged the team to keep reaching for the prize. In his senior year at Ludden, Infanti and his team did something special on the court as well. They captured the 1994 state championship trophy. Infanti still stays in touch with Donnelly, a ’76 Ludden alumnus who has coached at his alma mater for 26 years and was honored by the New York State Basketball Coaches Hall of Fame in 2013. That family feel was a hallmark of Infanti’s Catholic schooling through the years. Raised by parents whose own parochial schools backgrounds influenced the way they raised him and his sister Lynn, he credits the tight-knit community in which he has been educated with helping him face even the toughest of life’s challenges. Christy Perry is a freelance writer in Syracuse, NY.